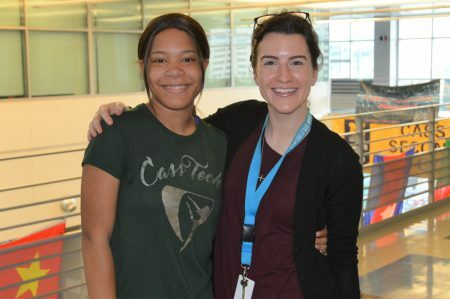 Erin Prim (right) is an English Instructor at Cass Technical High School in Detroit. Cass Tech has hosted our Winning Futures program for seven years. Pictured with Erin is 11th grade student, Chloe (left). I have been nothing short of impressed with the Winning Futures program, the leaders, and each and every mentor who interacts with my students. The curriculum is hands on, applicable to my students’ current lives and professional futures, and is so clearly appreciated by my class. The program gives my students a great opportunity to think through their future in a realistic and goal-oriented setting, allowing them the opportunity to meet and network with a variety of local professionals, and feel supported by responsible, trustworthy adults. As I reflect on how Winning Futures is celebrating its 25th year of mentoring students, I am extremely grateful to have participated in this program. I often refer to myself and my students as a team. This year I felt so lucky to extend our team to include the mentors of Winning Futures. On both my students’ bad days and best days, they would express the need to talk with their mentor – and that recognition itself feels invaluable. This program and the people who so fiercely dedicate their time to students have ensured that our whole team (our school, the junior class, and my students) will continue to grow stronger.